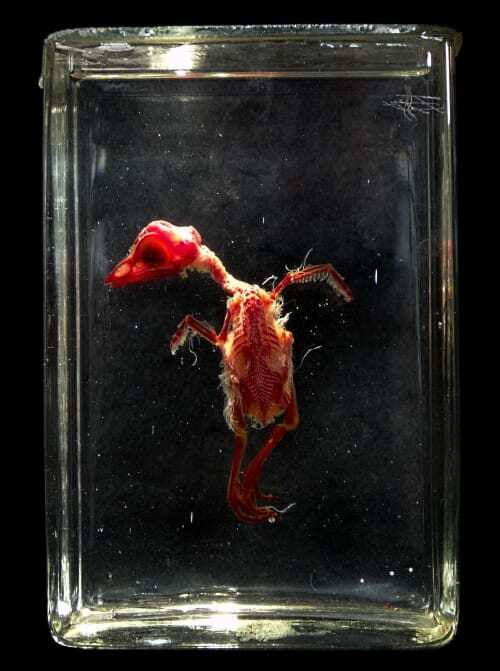 This is one of our specimens that has recently returned from being conserved and you can see that it’s not just any chicken chick, because its body is transparent and its skeleton is stained red. This is due to a chemical process that removes water from the tissues and make them clear, in this case the chemical used is methyl benzoate. Then the red pigment alizarin is used to stain the bones, by attaching chemically to the calcium they contain. This can only work on specimens that are small enough for the tissues to be effectively cleared, which puts a limit on the size of animal that can be treated using this process. The real beauty of this technique is that it allows the skeleton of an animal to be seen in its proper position within the body. Normally when you have a skeleton in a museum the bones have all been jumbled up during the preparation process and then they are painstakingly put back together. This can mean that very small bones are lost and even bigger bones may not go back in exactly the right place. 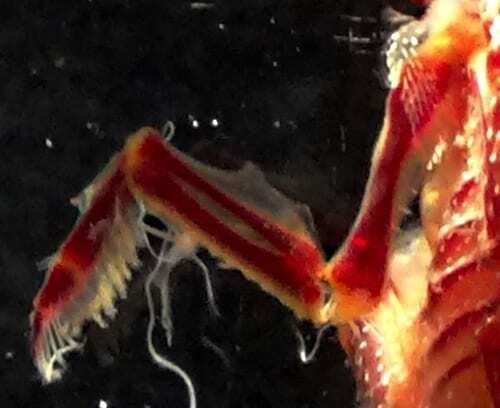 Feathers are a bit of a problem for this sort of technique, since they don’t become transparent like the wet body tissues, so they are removed. However, you can still see the neat rows of white feather bases that are embedded in the soft tissues of the wing and shoulder. In an adult bird the feathers would be better developed and some may even attach onto the bones of the wing. That’s because they need to be connected strong enough to transfer the forces involved in flapping flight, which are quite massive, especially for a heavy bird like a chicken – and yes, chickens can fly, they’re just not very good at it. Why doesn’t it look like an adult chicken? An interesting feature of vertebrates is that when they’re young they don’t just look like miniature versions of adults. This is something called developmental allometry and it reflects the fact that different parts of the body develop at different rates. For example, brains and eyes do most of their development quite early on, so they tend to be proportionally bigger in the skull of young animals than in adults. This means that young vertebrates usually have big braincases and eyes, but a relatively short face. That’s exactly what we see here in this specimen – you can see the huge eye socket and the bulging braincase just above it, which dominates the skull. As the animal grows the rest of the skull starts catching up, getting more robust and extending the face and beak. One feature associated with newly hatched birds is missing from this specimen – the ‘egg tooth’ which is a small spike on the top of the tip of the bill (a bit like a mini rhino-horn) that is used to break out of the shell and is usually lost on the same day as hatching. So although this poor little chick died young, at least it managed to get out of its egg.